Which type of person are you? Do you like a re-set button? Do you like to start over? Do you like to write out goals that you hope to achieve? Or do you prefer to just jump into the New Year with spontaneity and just go for it? It’s not that we accomplish all of them or that we don’t fail some of them quickly. But we really like the opportunity to re-evaluate and re-orient ourselves. Spiritual – I think of ways I want to grow in my relationship with Christ. This category always includes spiritual disciplines that I think will help me grow. Mental –I think of at least one new thing I want to learn in the New Year. It may be something like archery, or how to use a new appliance or tool, or how to play a few chords on a guitar. I want this category to stretch my skills and brain. I also include how many non-fiction books I want to read by the end of the year. Marriage – Each year we try to think of a way we can personally help our marriage grow. One year Chad and I decided to try to out-serve the other one. Another year we decided to say something we appreciated about the other person every night. One year we decided to start the graduated tithe – where each year (regardless of salary) we increase our giving by a certain amount so that by the time we’re 50, we are at a certain level of giving, even if we receive no increase in income. Parenting – I think of how I need to focus my parenting – sometimes for all the kids but sometimes in an area I think each child needs as an individual because of their age or journey with Christ. Relational – This category includes family members outside of Chad and my kids, and it also includes friends. I try to think of goals that would enhance those relationships in deeper, more significant ways. Physical – Each year I try to list at least one physical goal pertaining to exercise. For example, one year I wrote I wanted to do a half marathon. I know that I can do my ministry and my parenting better if I am in shape! I don’t hit all my goals, but I do go into the year with a strategic plan for my personal life. We have another strategic plan for our ministry as well. Often, I also ask God for a word to focus on during the year. This year God gave me two words – renew and remember. I’ll write future posts on these two words. 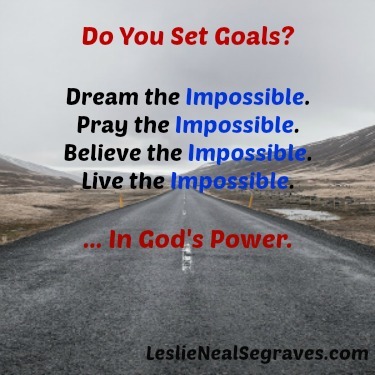 Here I come 2016 – with Christ I am dreaming the impossible, praying the impossible, believing the impossible, and living the impossible… in God’s power! Excited for the New Year!